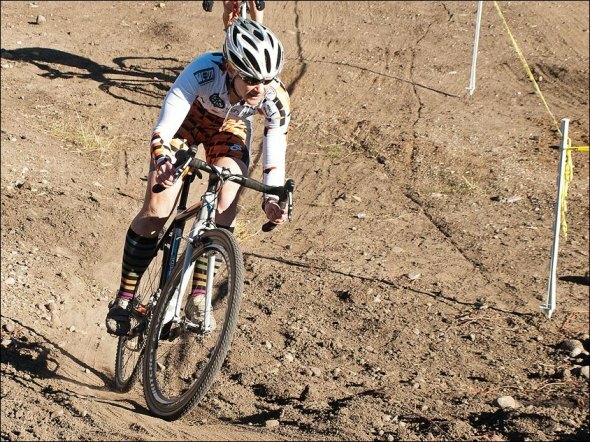 The Halloween weekend marked the end of the 2011 Montana Cyclocross Series. While for many the highlight of the season was Rolling Thunder the weekend before, the turnout for the final weekend in Bozeman was nothing short of impressive. 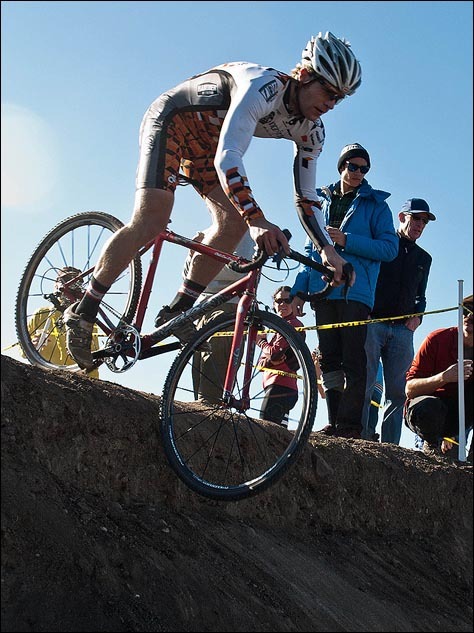 With the MuleCross and State Championship titles on the line, the competition was intense on courses that required a good mix of technical riding skill and fitness. Montana Velo strongman Frank Gonzalez commented that these two races fit well within the Montana Series as a whole which has seen better race promotion and improved courses. “We are raising the game in Montana,” said Gonzalez. 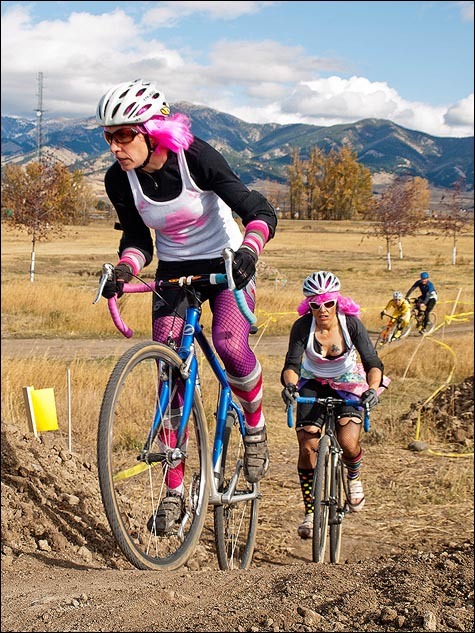 MuleCross has become a regional favorite for its festive atmosphere and offerings of prize money to not only race winners, but to the best costumed racers. Costumes this year did not disappoint and included a roller derby team, Angus Young from AC/DC, a B-52 complete with propellers, a dinosaur and numerous other notable outfits. “Even though it was a costume race, we showed up ready to race full-on!” noted women’s state champion Lisa Curry. 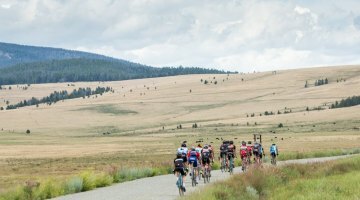 Pairing MuleCross with the State Championship was a new endeavor bringing Team Muleterro together with the GAS/Intinsik Cycling Team in what appeared to be a very successful and fun weekend. 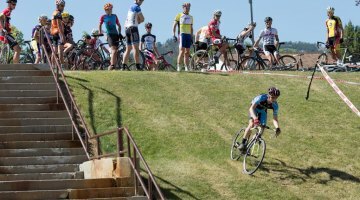 With so much on the line in Sunday’s race, racing was even more intense, and several course features encouraged lots of great crowd participation. On both days, a veritable who’s who of MT Women’s Cyclocross toed the line. Perennial favorite Lisa Curry stated, “It is nice to know that the cards have not been dealt when you show up to the line this year. This is the deepest field, with the most women at the front that I have seen in Montana. It makes it fun to race!” Among the women in the mix this year are MontanaCyclocross.com’s Lindsy Campbell and Muleterro’s Julie Zickovich, both known for their punchy, aggressive style. 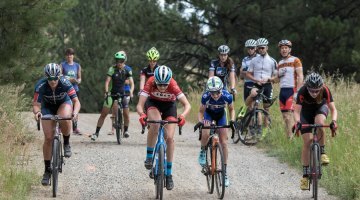 In addition, there were a few “sophomores” to the sport, Ingrid Lovitt (Hellgate Cyclery) and Anna Jo Dingman (Cycleution), who have shown significant improvements this year by taking wins throughout the season. From the gun on Saturday, Zickovich jumped off the line, taking the holeshot and maintaining a lead much of the first lap stating that she was ready to show her best form of the year. Curry put in a dig before a technical section that contained several berm turns and a series of “whoops” establishing a gap that would stay steady for much of the race. Zickovich and Dingman tried to bridge up, but Curry proved too powerful. This brought about a battle for second where Zickovich was able to establish a small gap that Dingman closed down until midway through the final lap when Dingman was able to get around and maintain a very slim margin to the line. Overall, the top three women were separated by less than 30 seconds. Sunday had a similar scenario play out with Campbell taking the hole shot and establishing a small lead through the first half lap before Curry took control. Zickovich and Dingman began where they left off on Saturday, locking horns in an impressive battle out of almost every corner. They went through corners side-by-side bumping elbows, reminiscent of the epic showdown between Villeneuve and Arnoux in the 1979 French Grand Prix. At the end of the second lap, Dingman made a big move to pass Zickovich on the finish straight, but crashed in the subsequent corner. At this point, Zickovich made the bridge up to Campbell who was riding in second place then Lovitt and Dingman joined to form a group of four. All four seemed to be trading punches, while trying to put some pressure on Curry in the lead. Sunday’s race brought a few more contenders out to race. 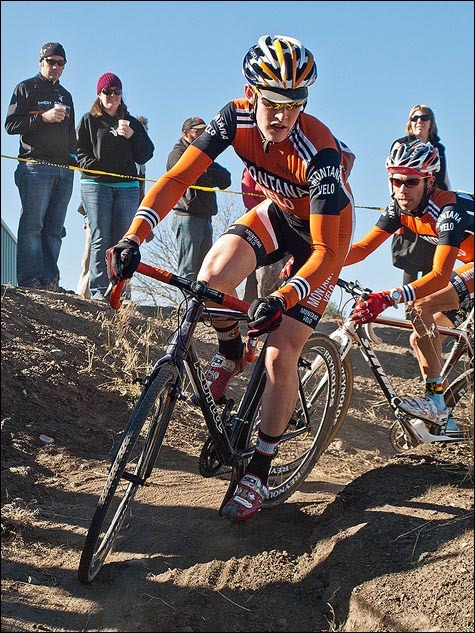 On the line with Gonzales, Presta, Morgan, Beckner and Curry were Hellgate Cyclery’s Toby Meierbachtol, and Montana Velo’s Scott Herzig. After a flat the day before, Curry jumped to grab the holeshot. Meierbachtol and Presta were not going down without a fight and the three gained a small lead on Gonzalez. Beckner and Herzig got off to slower starts and worked their way through the field. As Beckner was working his way up to Gonzales in fourth, he unfortunately rolled his rear tire on one of the berm turns and had to run quite a distance to get a spare. Meanwhile, the battle up front was fierce with all three admitting it was fastest and easiest to be on the front as there were not many opportunities for drafting. Presta unfortunately had a flat and dropped off to change bikes at the midpoint of the race leaving the other two to duke it out, with Gonzalez just on the other side of a small gap. Curry managed a dig that gapped Meierbachtol, who then overcooked a corner resulting in his rear derailleur going into his back wheel. That moved Gonzalez up to second and within sight of the win until a crash with a lap and half to go gave Curry a comfortable margin for his first outright State Championship win.